Kimberly Harvill shown in a drawing authorities released in hopes of identifying her after her body was found. Suspects Joshua Robertson and Brittany Humphrey were arrested Thursday, Aug. 25, in Pueblo, Colorado. GORMAN – A man and the younger sister of a woman found dead near state Route 138 were arrested Thursday in Colorado, as detectives continued to investigate the motive for the slaying and the subsequent kidnapping of the victim’s children. Kimberly Harvill’s body was found Aug. 14 in some brush by a motorist traveling along Gorman Post Road, north of State Route 138. Harvill, 26, had been shot in the upper body, the sheriff’s department reported. Her three young children were found safe Wednesday in a motel outside Albuquerque, New Mexico, in the care of a good Samaritan who notified local law enforcement, according to the Los Angeles County Sheriff’s Department. 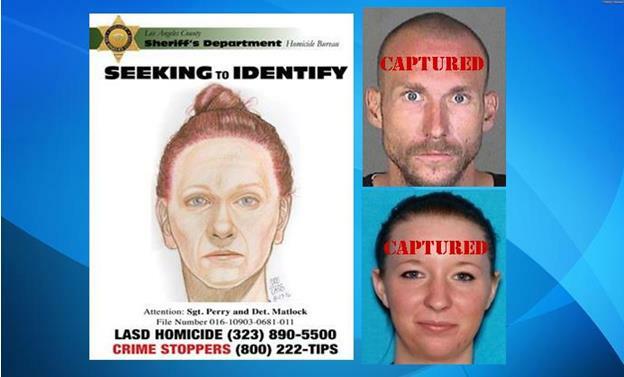 Their alleged kidnappers, Harvill’s 22-year-old sister, Brittany Humphrey, and her friend, 27-year-old Joshua Robertson, were arrested Thursday in Pueblo, Colorado, according to Deputy Grace Medrano of the Sheriff’s Information Bureau. Robertson’s 1 1/2-year-old daughter, Madisyn Harper, was located at a motel along with Humphrey by Pueblo police officers conducting an unrelated investigation, Medrano said. The child, who had reportedly been handed over to Robertson by her mother before she went to jail, was unharmed and is now in the custody of local authorities in Pueblo. Robertson was located about two blocks from the hotel and both he and Humphrey were taken into custody without incident, according to Medrano. Humphrey and Robertson were wanted in connection with the kidnappings of Harvill’s children and for questioning in connection with Harvill’s slaying, authorities said. The sheriff’s department was working with the Department of Children and Family Services to arrange for the safe return of Harvill’s children — Joslynn Watkins, 2, Brayden Watkins, 3, and Rylee Watkins, 5 — to California. Robertson has a criminal history, is on post-release community supervision and has a previous arrest for possession of a firearm, according to the sheriff’s department. 3 comments for "Suspects arrested in kidnapping-homicide"
There is to much of this crap any of the races ,theses children are so abuse from all these disfuctional family’s,, when they grow up they think that they can do the same, child serveses ,there over whelmed in some states ,grand parents are stress out ,or can’t help the United States is messed up big time don’t believe everything from clinton side is true ,trump he is telling people need to get the heads out of there. A _ _ ,,everybody wants Clinton because she keeps giving welfare out likes it candy and she has these women thinking she is better ,but real 8 hrs old what’s his name ? He double the national debt and did what let’s have a beer in the garden,and couldn’t re cite the oath right had to do it next day in the white say what no passing grade there ,so vote Dem . and see what u get . white on white crime !!!!!! where is the outrage? They caught them!!!!! disgusting people.